Is what we strive to achieve. ALL of the products we offer are the real thing - the original and actual brand whether that is Berkey, Seychelle, Klean Kanteens , ECOtankas or future offerings. In place of regularly purchasing throw-away plastic water bottles which leach BPA and other chemicals when left in the sun, why not try a re-usable, durable, stainless steel bottle that is BPA-free and will not leach toxins into your drinks? Over the long-term both ECOtankas and Klean Kanteen are not only practical and beautiful, but safer, healthier, more economical and eco-friendly. Stainless steel ECOtankas come in 6 sizes and have 3 types of interchangeable lids including a sippy spout adapter for toddlers. They also feature kooler covers in a variety of colours. Klean Kanteens are the original stainless steel drink bottle. They come in a variety of colours, sizes and types including wide mouth, insulated, wine karafes, classic kanteen, and a sippy spout kanteen for toddlers. They also feature a variety of additional accessories including lids, carabineers, totes, slings and bike cages. 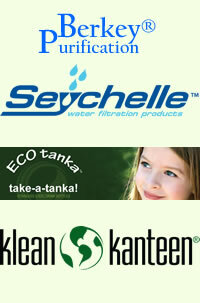 Berkey and Seychelle are among the best on the market for purifying waterin the home environment and on-the-go. They are strong enough to remove dirt, bacteria and disease without removing the minerals vital to our bodies. Both are used by the Red Cross and other relief organisations including in the recent earthquate in Haiti. Berkey gravity water filtration systems, featuring Black Berkey filters, come in 6 stainless steel unit sizes to suit your group, home or travel needs as well as the BPA-free, shatterproof plastic Berkey Light and the very portable BPA-free plastic Sport Berkey water filter bottle. Seychelle Water Filter Bottles are produced in both stainless steel (red, blue or silver) and BPA-free plastic varieties featuring state of the art Standard or Advanced Filters. 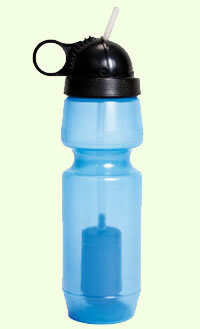 You can take your bottle and safely fill up in even in deepest Africa or Asia. To order or inquire, contact us through one of our onsite product order forms (found on each product page) or click here to email us. Our site operates on personlised assistance instead of an automated shopping cart. For shipping pricing on products to be shipped outside of New Zealand, please email us for a free shipping quote or if you have any other special requirements.